We are just finishing off our Canada trip, but Ben needed one more chance to cook with Nana, hence this week's The Kids Cook Monday! This layered salad was actually part of our New Year's Day dinner and Mr. Ben was quite proud of it--lots of opportunities for him to slice, dice, crumble and arrange the salad. Place 3 cups of lettuce at the bottom of a glass bowl, spinkle with salt/pepper. Layer eggs on top of the lettuce, sprinkle with salt. Layer peas, then remaining lettuce, then bacon, then cheese. Spread mayo evenly over top, sealing to the edge of the bowl. Chill 24 hours, sprinkle with green onions & paprika before serving. Looks great! But such a big bowl! For how many people is this recipe? YUM!! That's definitely a Southern dish - we call it 7 layer salad. 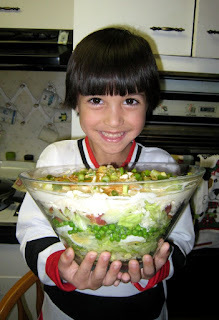 Well, actually I call it 6 layer salad because I don't add peas (yuk!) and we use sharp cheddar instead of swiss cheese. No matter how you make it, it's delicious! We make it in a large bowl for my parents, husband and I and we can eat on it 2-3 days, depending on our serving size.